The ruling Trinamool Congress and the opposition BJP, who are ready to battle it out in the Lok Sabha polls in West Bengal, are preferring turncoats over their tried and tested leaders. There is discontent over candidate selection within both the parties dominating the poll scenario in the state. Senior TMC leader and its South Dinajpur district chief Biplab Mitra said there is anger among grass-roots level workers of the party over giving tickets to newcomers and ignoring the old timers. 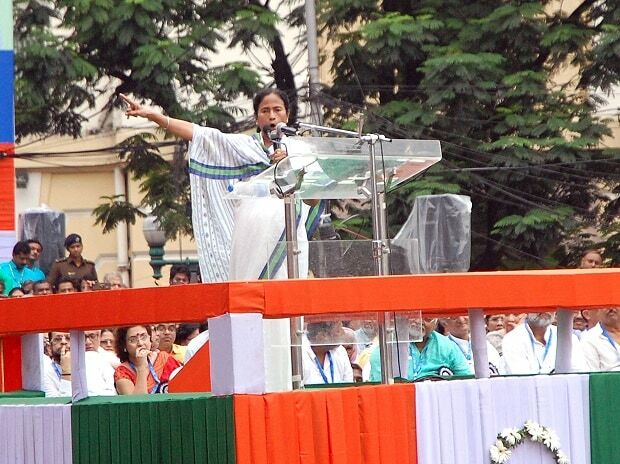 The TMC is going solo and has declared names of candidates for all 42 Lok Sabha seats. The BJP declared its first list of 28 contestants in the state Thursday. The two parties defend their decision, saying winnability was of prime consideration for them. However, the TMC feels it is the best way to quell the infighting in the party, whereas for the BJP, fielding turncoats had become a compulsion as it did not have enough candidates to assure its victory. "We have party leaders and workers who are working very hard. We had given them tickets in panchayat and assembly polls. But in case of fighting Lok Sabha polls, we don't have enough candidates who can put up a fight and win," state BJP chief Dilip Ghosh said last Friday. Out of 18 new faces in TMC's list, seven are those who have either switched over from the Congress or the Left parties in the past few years. Two of the TMC's sitting MPs in north and south Bengal -- Dasarth Tirkey and Sunil Mondal -- who have been renominated this time, used to be MLAs of Left Front constituents RSP and Forward Bloc, respectively. BJP's list has six candidates who were earlier either with the TMC or the CPI(M). It also includes the name of an ex-IPS officer, who was once considered close to TMC chief Mamata Banerjee. A TMC leader told PTI on condition of anonymity that infighting is one of the biggest problems being faced by the party this time. "There are so many factions in every district that it was next to impossible to bring all the disgruntled leaders on the same page... That is why in at least seven seats which are considered tough, we have pitted those who have come from other parties so that opposing factions will at least unite under their umbrellas to help us win," he said. Out of the seven candidates who have either switched over from the Congress or the Left parties in the past few years, three have been nominated from Bolpur, Medinipur and Coochbehar which the TMC had won last time. In Malda North, Raiganj, Jangipur and Murshidabad seats, which were won by the Congress and the CPI(M) last time, the TMC has nominated MLAs and MPs who had switched over from the Congress in the last two years. "In Cooch Behar, former Left Front minister Paresh Chandra Adhikary was nominated as only a strong candidate can ensure in retaining the seat in the face of factionalism and resurgent BJP there," said a senior TMC MLA from north Bengal. The reason is the same behind nominating former state Congress president Manas Bhunia from Mednipur and Asit Mal from Bolpur. Former Congress MP Mausam Benazir Noor, who crossed over to the TMC, and has been nominated from Malda North seat told PTI, "I had joined TMC as I feel only it can fight against communal BJP in the state." On the other hand, sitting TMC MP from Bolpur, Anupam Hazra has switched over to the BJP and has been fielded from Jadavpur seat in the city. In Murshidabad, TMC youth leader and key organisational man Shamik Hossain was overlooked in favour of former Congress MLA Abu Taher, who had switched over only last year. The situation is more difficult in the BJP, which had won two seats in 2014 and now targeting to win 23 seats in the state. The BJP has emerged as the main opposition party after the 2018 panchayat polls. The party in its first list has five candidates who had recently defected to it from the TMC and one from the CPI(M). Former IPS officer Bharati Ghosh who recently joined BJP will be contesting Ghatal Lok Sabha seat on the party's ticket. During her stint as the Jhargram SP, she was considered to be the defacto TMC district president. Former TMC MLA Arjun Singh, who recently switched over to the BJP, has been pitted against TMC's Dinesh Trivedi in Barrackpore. Singh had quit the TMC recently after the party denied him a ticket for the Barrackpore seat. Former TMC MP Soumitra Khan has been given BJP ticket from his Bishnupur seat, while former CPI(M) MLA Khagen Murmu will contest on a BJP ticket from Malda North. Former TMC leader Sreerupa Mitra Chowdhury, who had contested polls on that party's ticket from New Delhi, is the BJP candidate from Malda South seat this time, while TMC youth leader Nishith Pramanik, who was expelled last year, has been fielded from Cooch Behar. The BJP has fielded another TMC turncoat Bolpur MP Anupam Hazra from Jadavpur. BJP leader Mukul Roy, once TMC's number two, defended the saffron party's decision on fielding turncoats. "Anybody who wants to fight against TMC misrule in Bengal is welcome," Roy said. BJP workers had staged protest in Cooch Behar and Malda North against the party's decision to nominate TMC and CPI(M) leaders instead of local party leaders. Several BJP leaders, including its vice president Raj Kamal Pathak, have submitted their resignation and protests have been organised in various parts of the state over candidate selection. The seven-phase polling in the state will begin on April 11.